Saturday’s Wildcard battle between the New Orleans Saints and the Philadelphia Eagles will be headlined by two opposing quarterbacks who enjoyed legendary success at the same high school in Austin, Texas. The Saints Drew Brees guided Westlake High to its only state championship in 1996 and was named most valuable offensive player in Class 5A, Texas’s largest class. A decade later, the Eagles Nick Foles almost spear-headed the same success for Westlake, taking the Chaparrals to the title game as well, but that year Westlake fell to Southlake Carroll out of Dallas. When Brees and Foles meet Saturday on the field, the elder statesman can hold that over his successor’s head. "Yeah, he went to the state championship but lost," Brees joked. "We had a great high school program. I know they went to at least three or four state championships after my class left. They haven’t won another one though. We have the only state championship victory." Perhaps that would be Foles’ opportunity to remind Brees that he broke many of the records Brees set at Westlake, including career marks for passing yards and passing touchdowns. Actually, the shared alma mater serves as a bond between these two quarterbacks, a source of pride and a reason to root for the other one, except this Saturday. "I’ve always watched him from afar," Foles said. "He’s a great player and one of the best to ever play the game at the position. He’s a guy I’ve watched and learned from and he’s done a lot of great things throughout his career, on and off the field, and he’s a great role model for fellow players, kids and adults." Foles certainly seems to be taking the initial steps to follow in Brees’ pro football steps. Although Foles isn’t sporting a list of accolades anywhere near the one Brees commands, Foles is enjoying a promising start. This season, Foles set several Eagles franchise records, shattering many of Donovan McNabb’s former benchmarks, including a 119.2 quarterback rating, a 64.04 completion percentage and 0.63% interception percentage. Foles also tied the NFL record of 7 passing touchdowns in a single game when the Eagles visited the Raiders. "I followed his career. 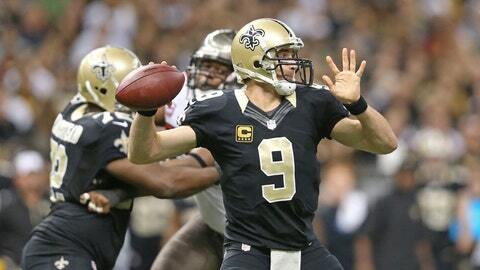 I follow a lot of the guys that leave Westlake and go on and kind of track what they are doing," Brees said. "Nick, I know he went to Michigan State and then transferred to Arizona and had a great career there and then goes to Philadelphia and look at what he has done. He has been pretty impressive for such a young player, mature beyond his years. I wouldn’t say that I am all that surprised because he is a Westlake guy. He has played great."